Livar is a technologically modernised and comprehensively equipped foundry. It has a melting plant, shaping plant, casting finalisation, model toolmaking shop, core production plant, and mechanical processing. Such organization of production allows us to manage the entire technological process in the production of castings and workpieces. Our production is thus distinguished by an integral process, adaptability to customers, and short production periods. 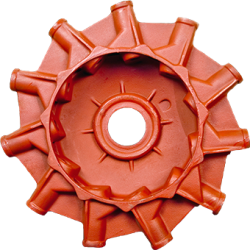 Livar produces castings from low alloy grey cast iron (150, 200, 250 and 300) and ductile cast iron (400-7, 400-15, 450-18, 500-14, 600-3, 600-10 and 700-2), as well as castings from other types of cast iron with specific mechanical properties (EN-GJS 400-18 LT, EN-GJS 400-18 RT). Our melting and molding plants have an annual production capacity of up to 35,000 t.
We produce castings of various shapes: from thin-walled (from 5 mm) to thick-walled (100 mm), from simple to complex, and coreless or multi-cored castings. 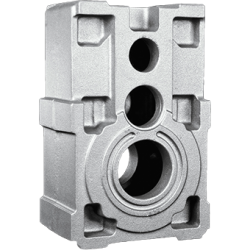 The maximum dimensions of castings are 900 x 700 x 400 mm. Their maximum weight is 150 kg, or 200 kg for grey cast iron. 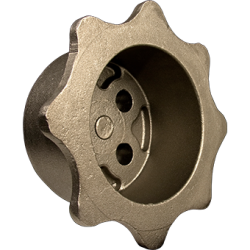 Emphasis is placed on a sand mixture ensuring the quality surface of castings and dimensional precision in line with the EN-8062-CT8/CT9 standard. In order to improve mechanical properties, or at the request of customers, we perform voltage and ferritisation annealing. We also offer the option of coating (red, black or yellow) using an anticorrosion protection procedure comprising immersion in water-based paints. Special attention is devoted to developing technological solutions in cooperation with customers, starting in the design stage. This allows us to achieve better work process optimisation and, consequently, the higher quality of our products.